The GODAN Action Team is pleased to announce a new call for applications for a free Open Data Management Online Course. Book your place now for the last chance to take the course before the end of the year! 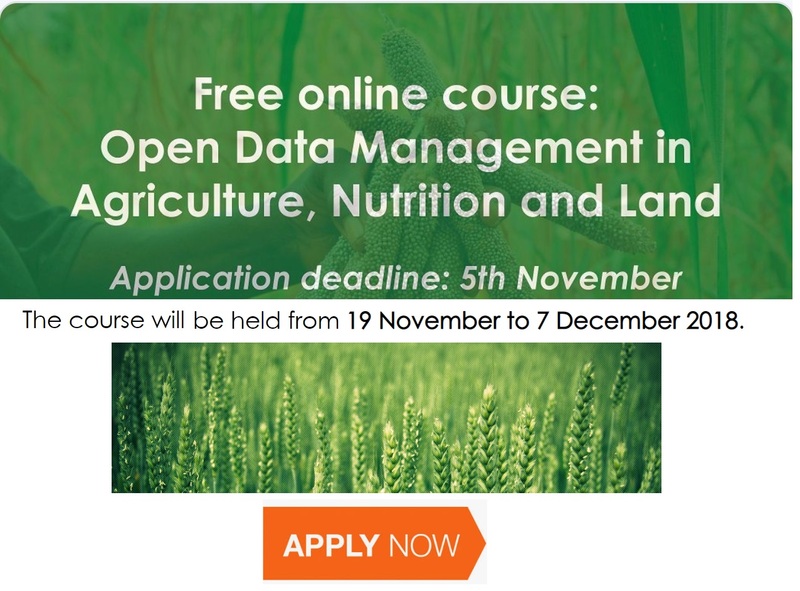 GODAN Action has been offering a MOOC (Massive Open Online Course) on Open Data Management in Agriculture and Nutrition since autumn 2017 in addition to a number of face-to-face trainings. This free online course aims to strengthen the capacity of data producers and data consumers to manage and use open data in agriculture and nutrition. So far, including the recent course that ran in October 2018, 2700+ people from 120+ countries have been trained on open data management through this online course. This time around the course content has been enriched with more content on nutrition data in addition to agriculture and land. We particularly invite those who are working in the nutrition field, both as data producers and consumers to apply for this course. The course will last 3 weeks (from 19 November to 7 December 2018) and is offered in English. Participants are expected to spend on average eight hours per week completing lessons and engaging in activities such as discussion forums and webinars. The course is free of charge. To apply for the course, please complete this online form by 5 November 2018. A detailed curriculum of the course is available on the GODAN Action website. For further information, you can always contact us at godanaction@godan.info; visit course website. This online course is the result of a collaboration among GODAN Action partners, including Wageningen Environmental Research (WUR), AgroKnow, AidData, the Food and Agriculture Organization of the United Nations (FAO), the Global Forum on Agricultural Research (GFAR), and the Institute of Development Studies (IDS), the Land Portal, the Open Data Institute (ODI) and the Technical Centre for Agriculture and Rural Cooperation (CTA).